Issues: Additional information for re:Coded Ultimania, and CoM edition's price. Also needs actual information of what's inside these books, not just the cover. Kingdom Hearts Ultimanias are Japanese informational books about released games in the Kingdom Hearts series. The books contain similar information to a strategy guide, although it goes much more in depth. An Ultimania also contains additional and exclusive content, such as artwork by Tetsuya Nomura, interviews with the staff behind the game, and clarifications on the story. As of yet, no Ultimania has been released outside of Japan, and no plans have been made to do so. Height - 21 x 15.2 x 3.2 cm. The cover of the Kingdom Hearts Ultimania displays the main protagonists of the series, Sora, Donald Duck, Goofy, Riku, and Kairi. Each of the protagonists featured on the cover are displayed within their own panels. Donald and Goofy's faces are visible within theirs. Kairi is visible from her head to her thighs, her legs continuing beneath Donald's panel. Riku's head and shoulders are displayed within his panel, his waist and a portion of his leg visible beneath Goofy's panel. 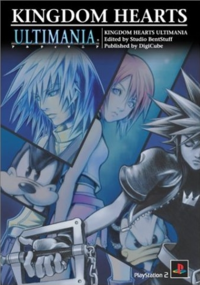 Sora, who is also the only character on the cover to be black and white, have his eyes closed, and not be encased within a panel, overlaps each character's panel and holds the Kingdom Key in his hand. Height - 21 x 15 x 4 cm. 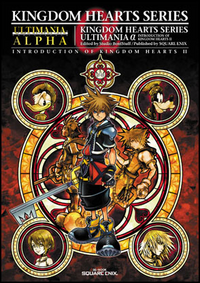 The cover artwork of the Kingdom Hearts Ultimania depicts Sora as he appears in Roxas's version of the Awakening, with Riku, Kairi, Donald, and Goofy behind him, and encased within a heart-shaped border. On the sides stand the hooded Xemnas and Ansem against a dark sky background. 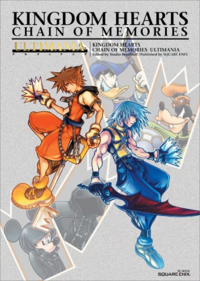 The cover artwork of the Kingdom Hearts Chain of Memories Ultimania shows the game's artwork of Sora and Riku standing back-to-back, and card versions of King Mickey, Marluxia in his hooded form, Donald, and Goofy in the background. Height - 21 x 15 x 1.9 cm. This Ultimania reviews the events of Kingdom Hearts and Kingdom Hearts Chain of Memories, also providing some insight into Kingdom Hearts II. The cover artwork is that of the "Awakening" Puzzle from Kingdom Hearts II Final Mix. Height - 21 x 15 x 4.4 cm. 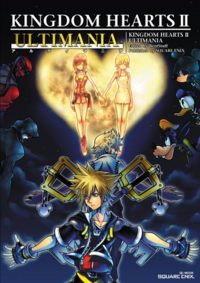 The Kingdom Hearts II Ultimania is known to contain more in-game information than any other Ultimania, such as much more detailed maps than the official strategy guide. 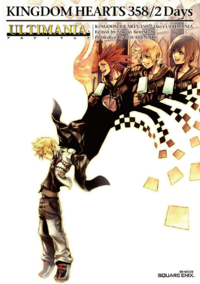 The cover artwork is that of the "Duality" Puzzle found in Kingdom Hearts II Final Mix. The Kingdom Hearts II Final Mix+ Ultimania details the compilation of Kingdom Hearts II Final Mix and Kingdom Hearts Re:Chain of Memories. 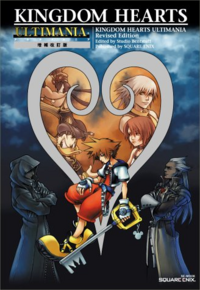 The cover artwork is the "Twilight" Puzzle found in Kingdom Hearts II Final Mix. Height - 21 x 15 x 3 cm. The Kingdom Hearts 358/2 Days Ultimania sports several insightful interviews that not only cleared up the game's story, but it also hinted at Kingdom Hearts Birth by Sleep. 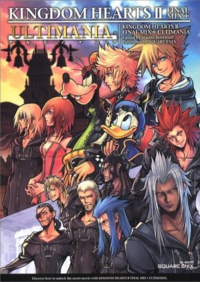 The cover artwork shows Axel, Roxas, and Xion eating sea-salt ice cream in the top corner in Twilight Town, Roxas also shown losing his Organization robe and having it replaced with his clothing from Kingdom Hearts II. Height - 22 cm x 15.5 cm x 4 cm. 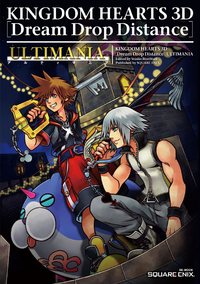 This Ultimania covers Kingdom Hearts Birth by Sleep. 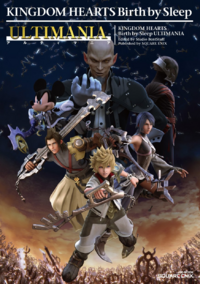 The book's cover shows the Keyblade Graveyard as the setting, while Terra, Aqua, and Ventus are centered, all wielding their corresponding Keyblades. Master Xehanort is menacingly seen above them, with Vanitas and King Mickey to his side. This is the first Ultimania to use Computer Graphics in the cover design. This Ultimania covers Kingdom Hearts Re:coded. 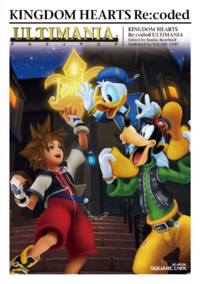 The book's cover shows Data-Sora, Donald Duck, and Goofy in Traverse Town high fiving one another. It includes a complete walkthrough of the game, interview with Tetsuya Nomura, and a complete guide to the Avatar Kingdom. This is the second Ultimania to use computer-generated imagery in the cover design. This Ultimania covers Kingdom Hearts 3D: Dream Drop Distance. The book's cover shows Sora, Riku, and a Meow Wow Spirit perched on the roof of a building in Traverse Town. It includes a complete walkthrough of the game, interview with Tetsuya Nomura, and a guide on Dream Eaters. The Kingdom Hearts Series Memorial Ultimania covers the entire Kingdom Hearts series. It covers all twelve titles, from Kingdom Hearts to Kingdom Hearts 3D: Dream Drop Distance, including the re-releases and Final Mixes. 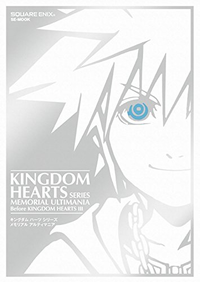 The cover features a white sketch of half of Sora's face on a silver background, with his eye colored in blue. It was released on October 2, 2014 alongside Kingdom Hearts HD 2.5 ReMIX. 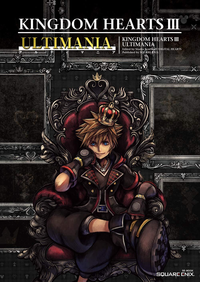 The cover artwork of the Kingdom Hearts III Ultimania shows artwork of Sora on a throne.